The blow-by-blow account of how Gibson's initially despised ugly duckling transformed into one of the greatest electric guitars of all time. We tell the story of the real godfather of modern rock 'n' roll, complete with a brilliant style file to help you master his unique playing style. As a member of the Funk Brothers, Dennis Coffey's played on more hit records than you've had hot dinners. The legendary Motown guitarist tells us what it takes to funk. We chat with hot-shot guitarist Doug Aldrich about life in the bosom of the Snake, working with Coverdale and guitarist egos. Our pick of the most exciting products we found at this year's Frankfurt Musikmesse show. Q&A, all the latest gear and artist news, your letters, columns and much more! 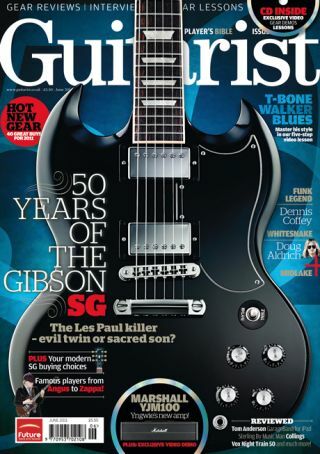 Guitarist issue 341, is available now from all good UK newsagents, or as a digital magazine for PC, Mac and iPad from Zinio. Non-UK readers can purchase a copy from www.myfavouritemagazines.co.uk.